We manufacture High Temperature refractories like element supports, muffles, crucibles, saggers etc. as per customer specifications. As a remarkable business firm, we are exquisitely engrossed in the realm of providing a wide variety of Ceramic Refractories. Since our establishment in this market, we are highly instrumental in the sphere of offering a best-in-class Cement Ceramics Castable to the prestigious patrons. Kiln furniture is made of cordierite because it will survive thousands of heating and cooling cycles. We are one of the reputed manufacturer of High Alumina Bottom Pouring Refractories that is being used in making Special Alloy Steel Ingots.We are supplying this product with best of satisfaction to our valued customers with low penetration rate of Refractory particles in the molten steel. Our Monolithic Refractories are easier to install and repair than shaped Refractories. The different types of shapes and monolithics that we offer are as per B. O. Q. of the client or as per design either done by us or the client. Further, the materials are widely preferred for its strong technical features. Ladle Shroud is an isostatically pressed refractory tube used to control the flow of liquid steel from ladle to Tundish. Monoblock Tundish Stopper is an isostatically pressed refractory tube used to control the steel stream flow. In our wide range of products, we also have Advance Ceramics for our clients. Our product range is precisely engineered to deliver superior electrical, mechanical, chemical and thermal properties. These ceramic products are well-reckoned for their optimum wear resistance, high tolerance to thermal stress and extreme conditions. High Alumina Low Ferric Refractories range of bricks are manufactured from premium grade raw materials and these are subjected to special firing treatment to fully develop. Due to our honest business standards, we are gradually making our way to the platform of success by offering Ceramic Refractories. 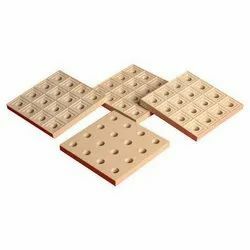 We are one of the trusted manufacturers and suppliers of a wide range of ceramic element support. These element support are element carrying bricks and tube hangers for supporting elements in high temperature heat treatment furnaces. These products are manufactured using quality basic material like mullite and sillimanite products, these can be bought at industry leading prices from us. They are ceramic infrared radiators designed to be used for the surface rating of up to 87 KW /m2. The gold-plated ceramic parabolic reflector is able to transfer 80% of the energy supplied as infrared radiation to the heating material. It allows the temperature of the material to reach to 700°C very quickly and operating temperature of 1000 degree is reached in less than a minute.